While both spirits work well year-round, I tend to think of rum as the supreme summertime drink and whiskey as more suitable for the cold winter months. Maybe that’s why, since November, I’ve been exploring the various blends of my favorite, most reliable Irish whiskey: Jameson. The 12 Year Old blend is a fine choice if you want to venture away from the traditional recipe but don’t want to break the bank. One of four blends in Jameson’s Reserve line, it has a suggested retail of $35 per 750 ml. bottle—a price that, in my opinion, indicates this whiskey is undervalued. The 12 Year Old Special Reserve, according to Jameson, is “matured for a minimum of 12 years in oloroso sherry and bourbon casks.” The blend was originally dubbed “1780” to honor the year the Jameson Distillery was established. After peeling away the burgundy foil from the classic green bottle, I was greeted with a corked top. This nice touch, which you’ll also find on the pricier Gold Reserve, is a simple yet underappreciated pleasure. The amber pour is strikingly similar to the original blend, if not with a slightly more golden hue. Laying the two whiskeys side-by-side, I also noticed similar legs. You won’t really discover any significant differences, in fact, until you take in the 12 Year Old’s aroma. There’s less of an alcohol tinge on the nose. And while you’ll find similar notes of honey and oak, there’s also a richer, syrupy scent with traces of fruit and leather. The balanced, complex flavor profile of warm almond, peach, and oak is simply heavenly as it slowly fades into spice. Full-bodied yet mellow. An ice cube or two will bring out more taste and round off some of the edges. The smooth finish goes on for days. Where the original blend is gentle and sweet, 12 Year Old is savory and comforting. 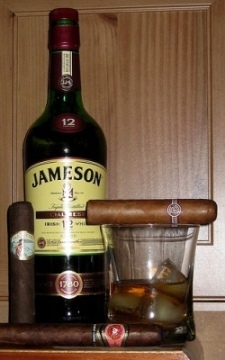 Unlike Jameson’s traditional recipe, feel free to couple this spirit with more powerful smokes. Particularly good pairings include La Flor Dominicana Double Ligero, Isla de Cuba Aged Maduro, Cubao, and the Montecriso Petit Edmundo. As you might have guessed, my verdict is this premium sprit serves as an exciting reminder that you don’t have to spend a fortune for a respectable whiskey. But Jameson 12 Year Old is much more than respectable; it’s downright sublime. So is the Gold reserve worth it as compared to the 12 year? Personally, while both are excellent, I think I actually prefer the 12 Year Old to the Gold Reserve. That makes it an easy decision given the $30 price difference. I love Jameson! The 12yr is a very nice beverage to enjoy. I recommend having it the traditional Irish way, with one ice cube.